Demonstrators in Barcelona march in support of the unity of Spain. PAimages/Matthias Oesterle/Zuma Press. All rights reserved.The Catalan crisis highlighted the salience of questions over state sovereignty and self-determination throughout Europe. A noteworthy side effect has been the widespread tendency, among political analysts as well as journalists, in various conflict-ridden parts of central and eastern Europe, to trace, however tenuous, analogies between their own cases and the Catalan question. Consequently, the ongoing crisis in Catalonia has been ‘translated’ into other hot button issues as diverse as the controversies over the ethnic Hungarian minorities in Slovakia and Romania or the annexation of Crimea and the turmoil in eastern Ukraine. Within the former Yugoslav space, quite a few policy experts and journalists sought parallels with the precedents of Kosovo as well as Croatian independence. With specific regard to the Western Balkans, how comparable is the latest crisis in Catalonia to case-studies from the Yugoslav dissolution? Can Catalonia’s ‘brand name’ generate external soft power in favour of the pro-independence movement and up to what extent? For a start, there exist structural differences between the former Yugoslav and the contemporary Spanish constitutional arrangements. Since the inauguration of the 1978 Constitution, Spain has been evolving along the trajectory of an asymmetric regionalization. By contrast to the implementation of the same model in postwar Italy, Spain’s ‘historic regions’ (Catalonia, Galicia, and the Basque country; later also Andalusia, up to a certain degree) were granted extensive competencies in regards to the management of regional revenues as well as the public use of regional languages. On the other hand, Yugoslavia was a federal state structured along the frame of a multilevel and highly devolved model (an ‘anti-model’ to the Soviet paradigm) which consolidated especially after the constitutional amendments of 1967-71 and the 1974 Constitution. This multilevel arrangement came to comprise entities as diverse as the federated republics, the autonomous provinces/autonomne pokrajine (Vojvodina and Kosovo), the local municipalities and the fundamental concept of self-management/samoupravljanje. 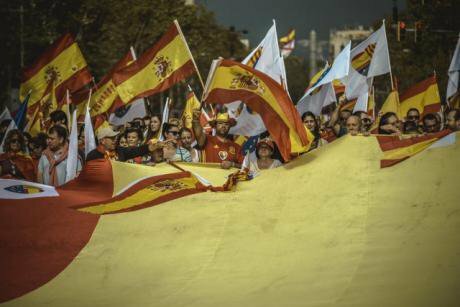 Article 2 of the Spanish Constitution (1978) defines the state’s order as founded upon the unity of Spain and the autonomy of the nationalities and regions integrated in it. However ambiguously phrased, this article reflected an early compromise between the Spanish/Castilian nation-statist/unitarian positions and the Basque/Catalan more asymmetric approaches and demands. On the other hand, all Yugoslav Constitutions included a clause which stated that ‘Yugoslavia is a community of nations equal in rights who, on the basis of the right of self-determination, including the right of secession, have expressed the will to live together in a federative state’. Although this item became subject to highly partial and conflicting interpretations throughout the turbulent late ‘80s and early ‘90s, it is this formal reference to the right of secession which clearly sets the Yugoslav case apart from the Spanish one. Furthermore, the Catalan case represents a rather unique example in which micro-nationalism seems to coincide with regionalism. Within western European political contexts, regionalism can be tentatively defined as a political movement for the extension of further administrative competencies to historical regions within the state. In this light, regionalism does not equal (apolitical) localism. The intensity of regionalist movements becomes more powerful in those cases where the following elements combine in space: geography; economic lobbying and powerful regional institutions; territorial mobilization. Traditionally, Catalan regionalism/micro-nationalism appropriated a centrist/centre-left profile and a pro-EU orientation. However, the impact of the latest economic crisis has also seen the dynamic emergence of left-wing parties (e.g. the ERC and the more radical CUP) as well as signs of, a mostly soft, Euroscepticism in the Catalan political scene. By contrast, regionalist trends within the former Yugoslav space have been rather weak and mainly restricted to the autonomous province of Vojvodina (Serbia) and Croatia’s northwestern region of Istria. Furthermore, the absence of the external homeland/kin-state and its decisive impact draws another qualitative difference between the Catalan question and any cases derived from the former Yugoslavia. For instance, the political elites of Prishtina currently seem keener on differentiating themselves from Tirana. Nevertheless, Albania had been constantly functioning in various ways as the ‘external homeland’ for Kosovo’s ethnic Albanians since the days of Enver Hoxha and until Sali Berisha’s term in office at the Albanian Presidency (1990s). Moreover, several Croatian nationalists had set the prospective incorporation of western Herzegovina and its ethnic Croat minority into the Croatian state as one of their top objectives during the armed conflict in the early ‘90s. Despite certain exaggerated claims that an independent Catalonia may function as a pole of attraction for the neighbouring Catalan-speaking areas, the irredentist and/or external homeland variable is largely missing from the Catalan case. At a first glance, Slovenia during the ‘80s is a case from the former Yugoslavia which might seem more comparable to the contemporary Catalan question. Throughout the ‘80s, the Slovenian elites had drafted several proposals for the asymmetric rearrangement of Yugoslavia’s federal structure which brought them into discord with the re-centralization demands championed by the Serbian League of Communists. In a comparable fashion to Catalonia within post-1978 Spain, Slovenia had also profited from the authorization which the federal authorities had granted to the constituent republics to manage their financial transactions with foreign agents themselves (especially since the ‘70s). However, the Slovenian case is certainly not identical to the Catalan largely in regards to the absence of the regionalist component as well as the aforementioned differences in the patterns of constitutional engineering within the former Yugoslavia and post-1978 Spain. From a broader cross-regional perspective, though, the latest controversy over the Catalan referendum still managed to ‘transfer’ questions over self-determination, territorial integrity and state sovereignty from the remote peripheries of the Dinaric Alps to one of the largest western European states. Moreover, it made such questions highly relevant and urgent also within the western part of the continent. Facebook, Twitter and other social media are being flooded with endless and emotionally tense debates between unionists and proponents of Catalan independence. Much of this debate has been revolving around Catalonia's historical (or not) entitlement to independence: Is there a longstanding, historical, Catalan identity? Or was Catalonia merely subject to the medieval kingdom of Aragon and Castile? The author of this short piece cannot help but recall the time when, 10-15 years ago, several among his Spanish acquaintances would resort to Balkanism and contend that: 'it is usually in the Balkans where people feel the urge to go all the way back to the Battle of Kosovo, King Zvonimir, or Alexander the Great in contemporary political debates'. Throughout the years, Catalonia has succeeded in establishing its own ‘brand name’. This is highly recognizable even among those who are not particularly acquainted with Catalan history and politics, regionalism, or the other subjects discussed in this brief piece. If just superficially, this ‘brand name’ consists of references to the city of Barcelona as a vibrant and artistically innovative urban space, Antonio Gaudi and the other cultural heritage, and, last but not least, FC Barcelona and the Camp Nou. In stark contrast, this ‘brand name’ aspect is largely absent from other cases of western European regionalism such as, say, Flanders; let alone the, potentially negative, external connotations that newly-founded concepts such as Lega Nord’s (far right) Padanian regionalism may engender. The ‘brand name’ dimension must not be dissociated from the political sphere. For instance, the incorporation of Buddhism into western alternative lifestyles swiftly engendered widespread support towards the cause of Tibetan independence. Furthermore, Ireland’s wider frame as a ‘brand name’ also helped attract a considerable percentage of third-generation Irish Americans, with an otherwise feeble connection to the land of their distant ancestors, to the Republican cause in Northern Ireland. In the Catalan case, European cosmopolitan liberals who tended to perceive Catalonia as a socially liberal space, and a region that punches well above its weight in various areas, soon voiced their support to the pro-independence movement. Most recently, the participation of leftist parties such as the ERC in the ‘Coalition for Yes’ at the Catalan Generalitat has also generated positive outlooks on the independentists among the European left. Especially in the crisis-hit parts of Southern Europe (e.g. Greece), several sections of the left have come to perceive, from separate perspectives, the Catalan debate as ‘one more battlefield in the struggle of the European peoples against austerity’. Coming back briefly to the former Yugoslav context, the so called ‘ten-day war’ in Slovenia (1991) turned out to be a particularly detrimental endeavor for the Yugoslav National Army’s (JNA) image. In addition to the symbolic dimension, the JNA’s subsequent capitulation bolstered nationalist hardliners in neighbouring Croatia. Although the context and the actual scale as such are not comparable, the Spanish state’s disproportional use of force in its attempt to prevent the Catalan referendum can still serve as an example of how governments may choose not to learn from historical precedents such as the Slovenian one. PM Rajoy’s choice apparently backfired and caused an upheaval across the global media and press. The extent to which this ‘brand name’ soft power may acquire a more articulate and full-fledged shape in favour of the Catalan independentists is conditional upon the prospects for either a compromise or further escalation within the immediate future.